This is an online review of the DVD Baby Einstein, Baby Wordsworth. With movie synopsis, cast, pictures, wallpapers, quotes, where to buy it and more. 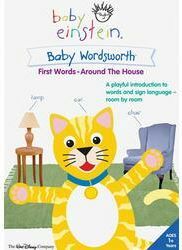 Baby Wordsworth First Words is a playful, interactive introduction to 30 words from around the home. This engaging discovery of language exposes toddlers to familiar objects in the kitchen, playroom, yard, and more. Special guest Marlee Matlin introduces little ones to the concept of non-verbal communication. aby Wordsworth is part of the family of award-winning Baby Einstein videos, DVDs, music CDs, Discovery Cards, books, and toys that explore music, art, language, science, and nature. We introduce young children to the world around them in fun, fascinating ways. All our DVDs are set to music specially reorchestrated for little ears. Special Guest Star Marlee Matlin Introduces Sign Language!